Husband feeling a bit better and we are pretty close to getting his medication regulated, so all is a little quieter around here. Kid is off on a three hour play date, so I am catching up with little fiddly things like digital photos and getting a few more packages ready for the post office. And blogging of course - gotta get back all the readers who left in a fit of boredom during that week and a half I didn't post. One of the many FOs that I have whipped out in the last week during my spasm of nervous knitting. There are for me, Jade Sapphire 6 ply cashmere, pattern from my web site http://www.knitting.allinfoabout.com/patterns/wristers.html . They work up in a flash and are so darn soft I just want to pet them all the time! I layered them over a nice pair of thin black leather gloves now that it is a bit too cold to just wear wristers, and they look great if I do say so myself. I made a pair in a pima/silk blend for the allergic sister, she got them for Christmas. While we are on the subject of Christmas, all knitted gifts were well received. The washcloths were a big hit with my editors, I am getting effusive thank you notes which is great. 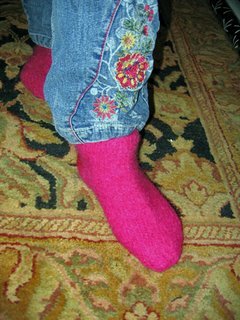 My sister LOVED the ugly scarf (my mother said "It isn't THAT bad"), and mother herself was quite taken with the warmth of her Fuzzy Feet. These photos are the first results of my Wilton experimentation - I am quite taken with the way the color shades. I have 150 yards of this worsted weight, haven't quite figured out what I will do with it yet. It is like Christmas all over again here today - so many of the online yarn stores were having big markdowns for the end of the year that I went a little crazy. Today brought a niddy noddy, some Cherry Tree Hill sock yarn which looks fabulous, some other sock yarns, some heavily marked down colors of Lamb's Pride worsted (kid wants a second pair of Fuzzy Feet, this time in purple), and a back issue of Wild Fibers magazine devoted to alpaca insights. Oh, and some circs - God I love half price sales! Off to hide some of the new stash, and to work on the socks I just cast on - Lana Cervinia in a red variegated colorway in a pattern from Nancy Bush's Vintage Socks, which I just love. Something to do during the next round of waiting in doctor's offices that won't get done too quickly. Wow, I didn't mean to be away so long, honest I didn't! But between holiday hell and the husband's never-ending surgical complications, I haven't been able to come up for air in quite some time. Which does not mean I haven't been knitting. Since I knit more when I am stressed, and knit while sitting around doctor's offices, I have gotten quite a few projects done in the last week - a cool poncho for the kid in Berroco Chinchilla, a washcloth for her, cashmere fingerless gloves in gray and black for me, and I cast on the Oak Ridge Socks from Vintage Socks for me, and Guinevere from Wrap Style for me. Hub's vascular dude says perhaps I should cast on a blanket to keep myself occupied for the next few months. Photos to come, I have taken a bunch, but haven't downloaded them from the camera. Santa brought me a whole lot of knitting books, with a little help from an exchange and a Border's coupon I had for after Christmas. Loop-D-Loop, Handknit Holidays, Socks Socks Socks, Vintage Socks, Not Just Socks, and Not Just MORE Socks have all taken their rightful places on my bookshelves. I also got a much needed ball winder which was way cool. And I also got one of any knitter's favorite holiday gifts, appropriate gratitude for knitted gifts I made. 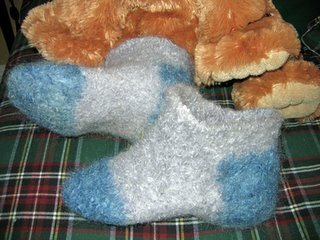 The washcloths were all a big hit, my mother loved her Fuzzy Feet, and my sister loved her glittery scarf. The kid has already worn her skirt and her boa scarf, so I know those were a hit too. It is wonderful to give hand-made gifts to those who appreciate the work that went into them. More tomorrow night when the photos are ready - off to rescue the kid from grandma's where she had gone to escape the medical madness here. Looking forward to having her back! It isn't like I haven't been knitting, I just haven't had ten uninterrupted minutes to sit and do a blog entry. I know you all hate the entries without photos... so here goes. Skirt for the kid. Some furry nonsense she liked on the hem, balance is Lion Brand Thick and Quick Chenille in black. She loves skirts, this one is a surprise for Christmas. And a distraction! 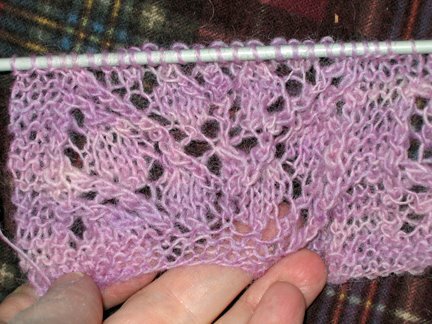 When I swapped sock yarn with someone, she threw in a ball of this lavender lace weight from HandPaintedYarns.com. It just stared at me and begged to be cast on as something, anything. Not a ton of yardage, but should be enough for a scarf. I like the Branching Out pattern on Knitty.com, but it wasn't going to be wide enough to suit me - I hate narrow scarves. So I did a modification by repeating the lace chart a second time. 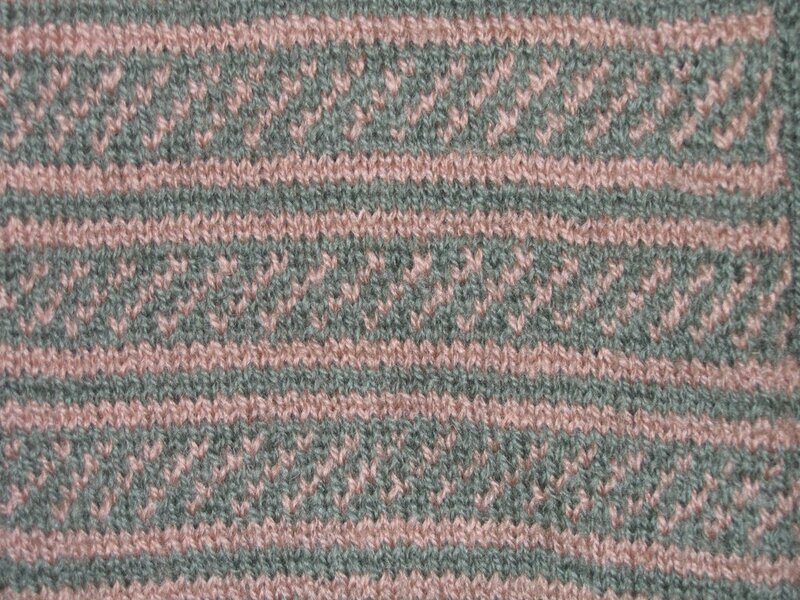 Now there is a garter stitch band up each side and up the center. It may take me the rest of my life to finish, but I have banged out so much brainless knitting for gifts and for charity recently that I like having to concentrate a little bit. Did I mention I got the 9 washcloths finished, finally? No photos, by the time I got to the last two they were coming off the needles and being dropped directly into the Priority Mail boxes! I already got two thank-yous though, so I know they are getting where they are supposed to. 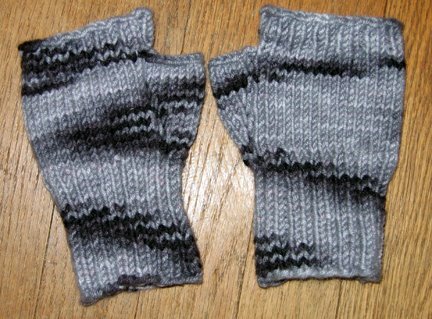 One measly pair of fingerless gloves left on the Christmas knitting pile, then back to knitting some things for the kid and for me. She has four things she wants all lined up - a washcloth (sigh...), a hat, a skirt, and a sweater. For me - I have yarn picked out for two pairs of socks, a pair of fingerless gloves (I lost one of mine at Carnegie Hall last year and it never got found) and a wrap from Wrap Style. And I have this monster Vogue scarf that I started last year and got bored with that I truly ought to finish. And now I have the Branching Out to finish too. 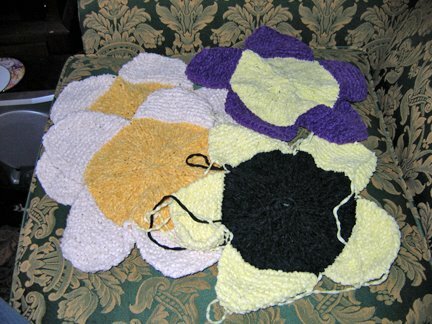 And I should start another Project Linus blankie, and have a few more pieces to do for Dulaan. Then there is the spinning... So I basically won't run out of projects to do in the near future. Off to the Post Office to mail the last of the washcloths - paired up with glycerin soaps from The Body Shop and plunked in a pretty red and gold bag, they really do make impressive gifts. a very long time ago (okay, it was 1988, but who's counting? ), I took a magical trip to New Zealand. It was amazing and I loved every minute of it, but one of my favorite things was this little odd gift store I found in a deserted-ish area on the North Island. There I bought a big hank of local DK weight wool in tan, and one in an olive green. Later I stayed two nights on a working sheep station, but that story is for another time, when the scanner is working and I can provide pretty pictures. The next stop on my road trip was San Diego, and I had a lot of time on my hands there for a few days while I was waiting for work to catch up (I did costumes in those days, pre-writing phase). 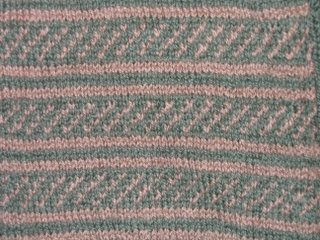 I went to the nearest general store type of place, and bought a pair of size 5 needles, and made up this pattern that night. 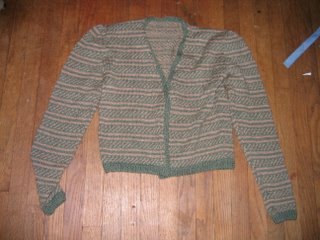 Now, that sweater hasn't fit me right in more years than I care to to admit, in fact due to my poor patterning skills at the time it didn't really fit well from the beginning, but I just couldn't seem to part with it. It has moved with me over and over and over again. I don't wear it, but I don't want to live without it. So I threw the sweater in the washing machine in the hopes of getting some wonderful felt to make a handbag or tote from. That way I can get a little more use out of my wonderful memory. Kool Aid fever has hit my household. It all started when I reviewed the book Yarns To Dye For (which I loved) for my web site (www.knitting.allinfoabout.com/book_reviews/yarnstodyefor.html for the full review). 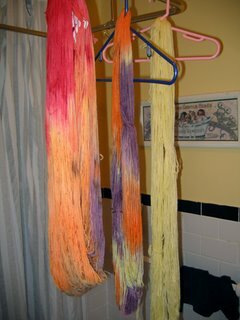 The kid and I both fell in love with all of the pictured hand-dyed yarn, but I was worried about health hazards from checmical dyes, so a friend suggested we try Kool-Aid. Next trauma was trying to find good colored flavors during the first snowstorm of the year, but we managed to find a lot of lemonade and orange, and a little bit of fruit punch and grape, so we went to town. Results are above - drying in the shower. It actually wasn't nearly as messy as I thought it would be, and it dried pretty quickly. 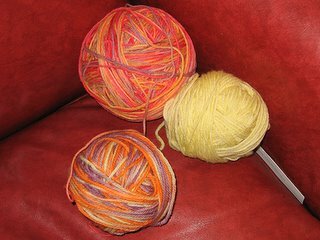 We did a whole 440 yard skein of KnitPicks sock yarn in all four colors, then cut a skein of worsted weight in half and did half plain yellow, and half three color variegated. All dried up and ready to knit or weave. The kid wants a knitted earflap hat out of the worsteds, pattern in the YTDF book. Some of the sock yarn will be socks for her, and whetever is left she wants to warp her loom with. She cannot wait to weave with stuff she dyed herself, but just like her mother, she has holiday gifts to finish off first. 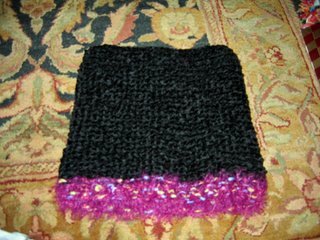 Speaking of holiday gifts, biggest big sister's glamorous scarf is finished. Boy it was annoying to knit, so I hope she likes it. She should like the colors though, plus it has eyelash which she likes, PLUS it has some gold sparkles even though they didn't turn up in the photograph, so I have high hopes that she will be happy. After the kid went to bed I worked a little bit on her surprise skirt for Christmas, but talk about boring - black chenille garter stitch on size 13 needles! Thankfully I only have a few more inches to go, and sewing it up should be very quick. And done is good. I asked Santa for a bunch of knitting books for Christmas, so hopefully I will have a wealth of more interesting patterns to choose from after 1/1. And I just saw the preview flyer for the Spring 2006 Interweave Press knitting books and I have to say, they have some really great stuff coming out in the new year. Cannot wait to get my hands on two of them specifically! Back to try and get some actual work done. The washcloth pile is growing. I wish I had used the paler yellow for the daisies and the darker yellow for the black-eyed-susan, but oh well, done is good. Working on a solid red one now, aiming for a total of 9 by 12/15 so I can get them in the mail. 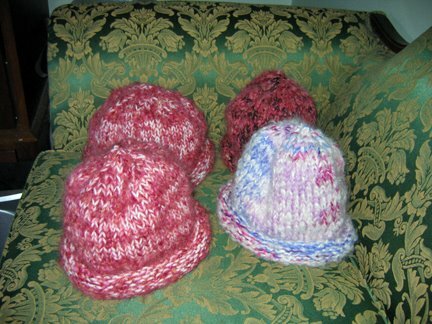 Final Knit Unto Others hat tally - 4. One of these hats goes into the Dulaan box, the other three will probably go off to the yarn shop in Vermont that was collecting. All three of the reddish ones were made with the Patons Divine in Floral Fantasy - one has a white companion yarn, one a pink, and one black. The pale one is pale pink Patons Divine with a blue/pink/violet variegated companion. My daughter wants that one, but I told her I could make her another one, I have plenty of both types of yarn left. Almost finished the glittery, eyelashy scarf for biggest big sister. 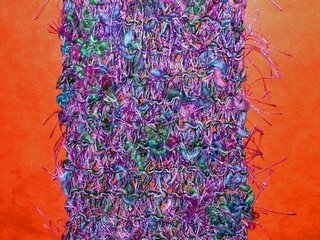 And the kid and I spent yesterday afternoon going crazy with plain wool and kool-aid, so I may have to make something out of that next. Thankfully, today the check fairy delivered two of the 6 checks I am expecting before the end of the year, so I can get the holiday shopping finished this week. The joys of freelancing - unpredictable cash flow! Not that I am complaining mind you, a recent foray back into the 9-5 world for a few weeks reminded me just how lucky I am to be self employed! I am too ornery to play nice with idiots anymore. Well, at least some photos, have to save some for the next post so you guys keep coming back! 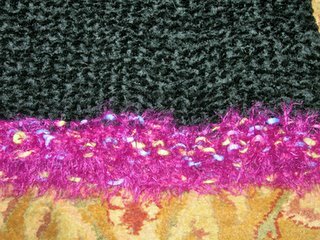 First off, the Extravagant Fuzzy Feet - farm-raised mohair/wool with Lorna's Laces Grace for the toes and heel. Let me say again, these make me happy just by putting them on, so in this case, expense be damned! There is a little more cuff opening than I would like (I had to alter the pattern to accomodate the light weight of the gray), so I plan to add some sort of closure as soon as I catch up with the holiday knitting, and I am still wearing them in the meantime. They are thick and soft and warm, and I am afraid to turn the heat up in this barn of a house so they are practical too! 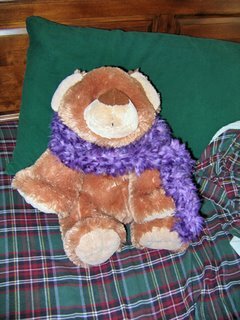 Note our lovely model, affectionately known as the Barf Bear because the kid's auntie gave it to her after a bout of nasty projectile vomiting while on vacation! 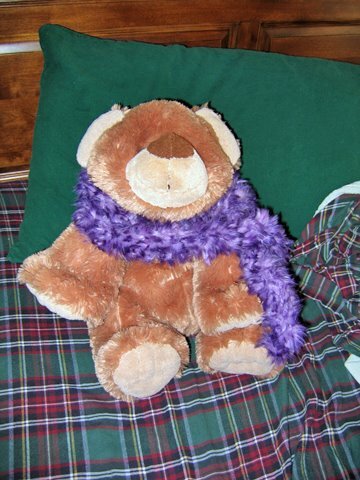 It comes out whenever she or I are not feeling up to par, and it very cuddly to sleep with. I love, love this boa-like scarf. 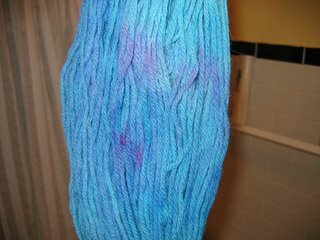 The yarn was a zillion dollars (anybody sensing a theme here?). I bought it on vacation last summer without looking carefully at the price, then almost had a heart attack, but now I am glad I had it. Thick, thick, thick fun fur (Plymouth Foxy), knit on size 17 needles in a three stitch I-cord, then fluffed out. I just love it, and the kid is going to freak out when she gets it on Christmas morning. Barf Bear in all her fluffy glory - she may not want to give it up! Doing the errand/laundry/cleaning/Christmas shopping thing today, back to the never ending washcloth pile tonight for knitting - still at 4 down one to go. And a very sparkly, eyelashy (all the things I hate to work with) scarf for the biggest big sister who didn't want any warm fuzzy feet for Christmas, darn her. I took the Lamb's Pride green I had gotten for those and returned it to the LYS the other night. When the owner asked what I wanted instead I blurted out "something ugly and sparkly" Love my sister, hate her taste. 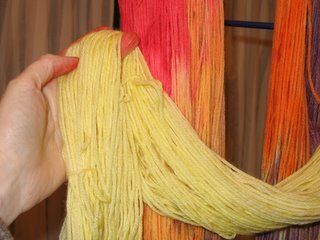 We settled on two skeins of Berocco Optik from the sale bin, with some carry along eyelash as if it wasn't quite busy enough! I don't want to offend those who live for sparkles and glitter and eyelash, but I just happen to not be one of those types of people. Although you wouldn't know it from all of the holiday knitting I am doing right now, would you? Anything to please the recipients! 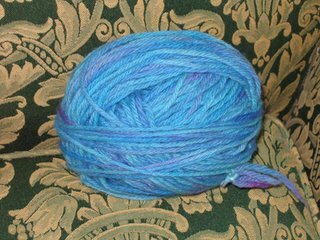 My first post-holiday knitting cast-on will be a cornflower blue alpaca/silk blend for Guinevere from the Wrap Style book. I can't wait! And you want photos don't you? Tomorrow, I promise! For the record? Got lucky with the parking and was in and out of there in a flash. Got a bag of Paton's Classic in black to stretch all of my oddballs into Dulaan knits, some incredibly obnoxious hot pink variegated Polar Spun for the kid (who keeps nagging me to cast something on in that already! ), some Cotton Ease in a lovely green for the next Project Linus blanket (pattern to be determined), and a bag of sock yarn in a red stripey colorway. I was worried about having ten balls of sock yarn in the same colorway, but put some up to swap on the Knitty board and it was snapped up almost instantly. So I am keeping four of the red, have two of the same stuff in the green colorway coming, some Dale baby weight, and if a new friend in New Zealand can manage it, some merino/possum blend. Possum yarn? I am faint with curiosity! I double promise I will drag out the camera tomorrow, I know these are boring with no pix, and I have a ton of things to show you all! So here I am, way behind schedule on a project, and I finally schedule all day today to bang a big chunk of it out (it is mostly written, I am editing, formatting, etc.) Then, when making an unscheduled internet detour to the Knitty coffeeshop (darn you Crazy Aunt Purl for telling me about that big old wonderful time-sucker :-), I am reminded that the mondo Smiley's yarn sale in Manhattan is going on today. I looooooooove that sale. I am pretty careful not to buy so much that the stash explodes, but they have some really great bargains there if you look carefully. And they don't take credit cards so I can't get in over my head. And it is only a 25 minute drive during the lunch hour, and they have parking. And I really want to go. But I really should be finishing up this project that is hanging over my head like a ton of bricks. Which will win out - stash or story? I will have to decide by 11:30 AM EST or it won't work out with the kid's schedule, so I only have 2 hours to dither. Check back tonight and I will let you know what I decided! Tons of knitting accomplished this week but no photos yet. Someof the FOs were holiday gifts for the kid so I have to take some shots after she goes to bed tonight. 4 washcloths down, 5 to go, one more hat for the Knit Unto Others KAL finished, and a fabulous obnoxious fun fur scarf for the kid done. I am working on a skirt for her too, after hours. 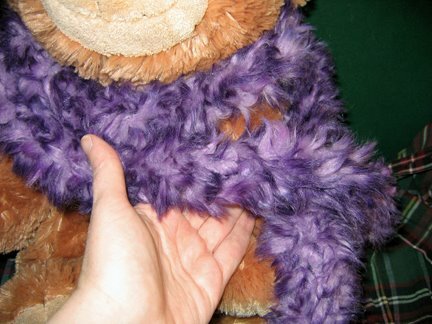 It is Lion Brand Thick and Quick Chenille so it is going very fast. My sister hinted broadly that she would like to have an everyday scarf from me this year (but with some sparkles, blech), so I am going to give up on her fuzzy feet and do a scarf instead. So I just have one more pair to finish for the kid. 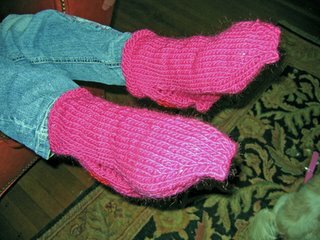 I absolutely love my own fuzzy feet - I had changed the pattern to accomodate some skinny yarn so I have a bit too much cuff opening, but I am going to think of something clever to fix that. They are incredibly thick and soft and just putting them on makes me happy, so there is something to be said for splurging on the good yarn, even for fuzzy feet. 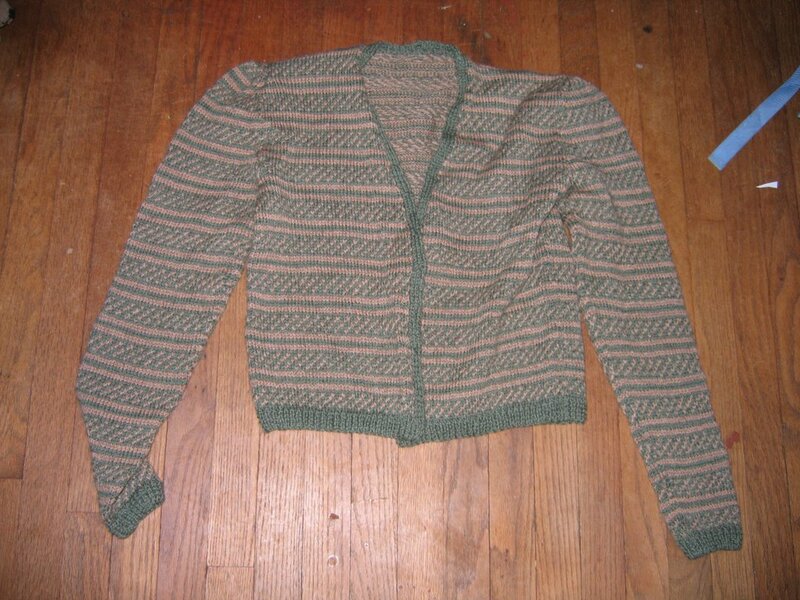 Will stop by the LYS tonight and exchange the dark green Lamb's Pride for something a little more glam for the sister. Anyway, if I am going to the yarn sale, I ought to get going and get at least a little work done on the story.